We will always exceed our customer’s expectations by individually analyzing comfort needs and wants, recommending the best possible solution to meet efficiency and comfort requirements, and provide prompt, courteous service. Premier Heating & Cooling specializes in keeping our customers comfortable. We are experienced in new installations, retrofits, indoor air quality, radiant heating, geothermal, small duct high velocity heating and cooling, liquid chillers, steam humidifiers and zoning systems. Whether it’s residential or commercial, we service all makes & models of heating and cooling equipment. We can analyze your comfort needs to determine which products will provide you with optimum comfort and value. With Premier Heating & Cooling, your comfort will extend well beyond the temperature of your home, office or business. As an American Standard Customer Care Dealer, Premier Heating & Cooling meets the highest professional standards, from our employee training to on-going customer service. 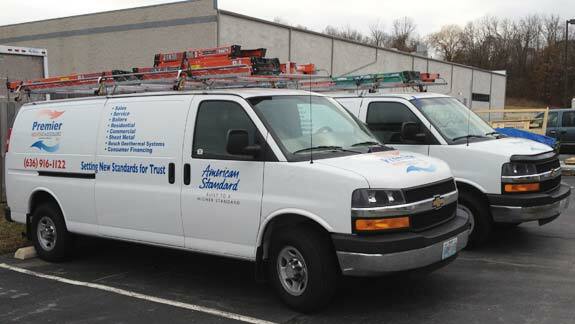 We take pride in our fast response time, quality workmanship, and friendly staff. Our technicians are at your service 24 hours a day, seven days a week. Whether it’s during our normal business hours of 8:00 AM – 4:30 PM Monday through Friday, or during evenings and weekends, if you need service call 636-916-1122, or complete our simple web form.